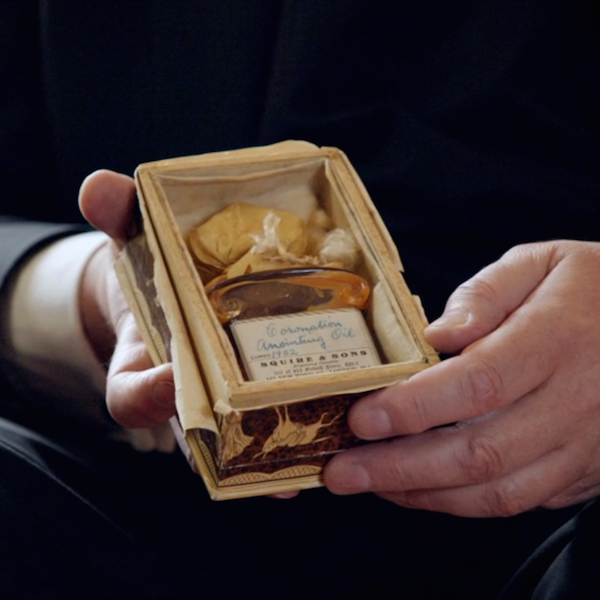 The fascinating recent BBC documentary delving behind-the-scenes of the Queen’s Coronation on June 2, 1953, held a scented secret for sharp-eyed fragrance fans… did you spot it? While discussing the ancient rituals of the act of anointing the monarch, our eyes were drawn to the oil itself – rather incongruously kept nestled in a battered old box and bottle of Guerlain‘s Mitsouko! The oil was made from a secret mixture in sesame and olive oil, containing ambergris, civet, orange flowers, roses, jasmine, cinnamon, musk and benzoin– actually sounding rather Oriental in its composition – and must surely have smelled glorious. The anointing ritual is always hidden from view – a private moment for the monarch to reflect on their duties and the significance of being touched by that oil – and so a canopy was held over the Queen by four Knights of the Garter, and the televison cameras turned respectfully away, as the Archbishop anointed her with the fragrant holy oil on her hands, breast and head. 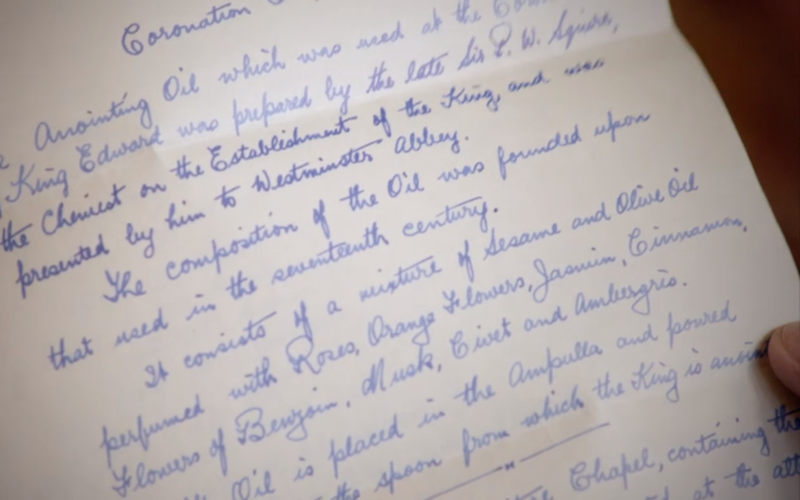 In fact, the phial containing the original oil had been destroyed in a bombing raid on the Deanery in May 1941. 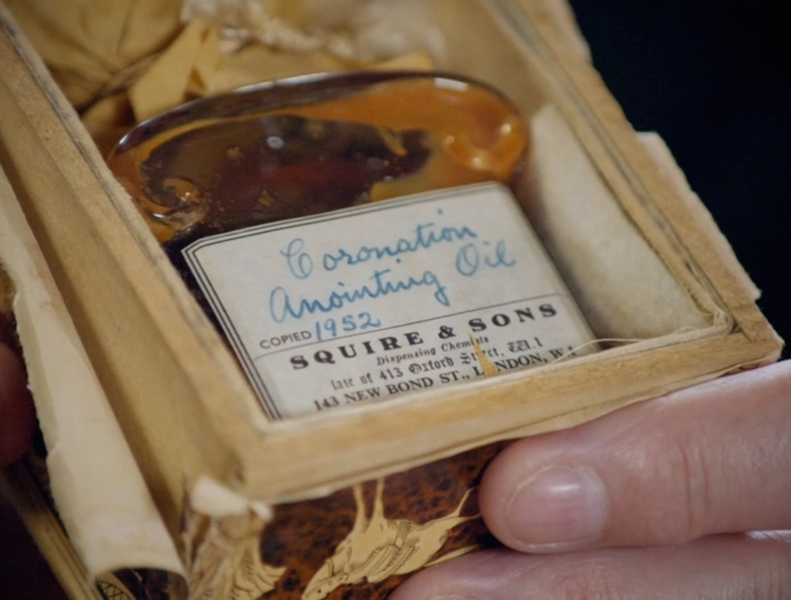 The firm of chemists who’d mixed the last known anointing oil had gone bust, so a new company, Savory and Moore Ltd, was asked by the Surgeon-Apothecary to mix a new supply, based on the ancient recipe, for the Coronation. We’d quite like them to whip up a batch for us, too. 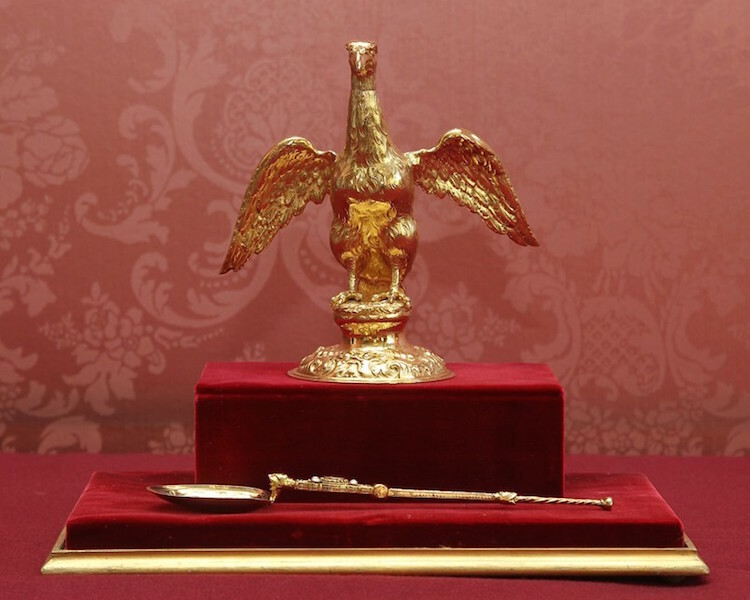 During the ritual, the highly scented oil was poured from Charles II’s Ampulla (the eagle-shaped vessel shown above) into a 12th-century spoon. One imagines the Archbishop’s hands must have shook just a little during this procedure – thank goodness for that canopy. Meanwhile, the choir sang one of the most thrillingly dramatic songs in history: “Zadok the Priest”. The words are taken from the first Book of Kings, and have been sung at every coronation since King Edgar’s in 973, but the anointment ritual is even older, going back to King Solomon supposedly being anointed by Zadok himself in the 10th century BC. Of course the rest of the Coronation was an extraordinary display of magnificent jewels and robes and the peculiarities of historical traditions played out ‘like a ballet’, as the programme described, but our minds kept returning to the mysteries of the anointing oil, what the Queen must have thought as she smelled it (was it the first time she’d smelled the oil?) and how it’s still, charmingly, kept in that tatty old bottle and box of Mitsouko. Those of you who missed the documentary can watch it while it’s still on BBC iPlayer.